A 25th anniversary is a milestone meant for celebration with family and friends. 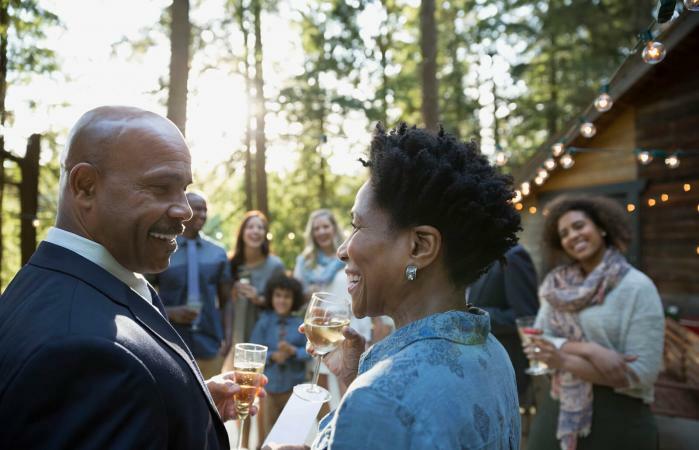 Give a speech that honors the special couple and lets everyone toast in their honor. 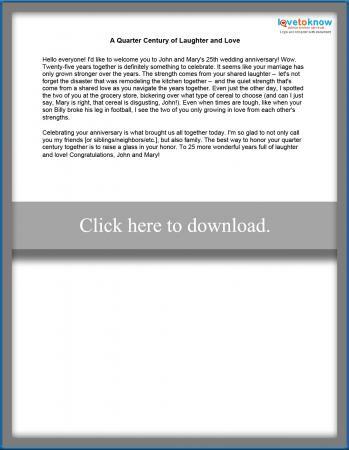 Both speeches are editable and printable using Adobe Reader. If you want to mention the times the couple has laughed, loved, and even cried together, you'll want to modify this speech to suit your needs. It's perfect for a couple who seems more in love than ever. If you do bring up a sad or difficult time, remember to end on a happy note before toasting. Click to print the toast example. The 25th anniversary is known as the "silver" anniversary, and for good reason. After all, silver is a precious metal, just like 25 years together is a precious amount of time. In this speech, you'll mention silver's properties and compare them to similar properties you see in the celebrating couple. Click to print the speech. While examples are good to get your creative thoughts flowing, you'll want to write something that comes from the heart and is personalized to the couple. Consider other themes for your toast or just follow your heart to personalize it. For best results, follow basic speech writing tips as well. Use one of these ideas to jumpstart your original speech. If the party has a secondary anniversary theme, such as travel or adventure, work this into your toast. Thread their trips and excursions through the years into a walk down memory lane. Pair it with a slideshow of their times together for a truly memorable speech! Since the couple has been married for 25 years, do a little "Remember when. . . " style of speech, where you mention the hot styles, biggest news stories, and other events of interest from their anniversary date every year. Make a list of the "Top 25 XYZ" for the couple. It could be the top 25 funniest memories, top 25 romantic moments, or whatever you know the couple will appreciate. Think about your relationship with the couple. How have they grown and changed over the last 25 years? What was your favorite memory as a child of the couple? Work this into the speech in the appropriate spot. Share a wedding anniversary verse you found that represents the couple and explain why. If you have only known the couple for a short period, speak with a few people who knew them 25 years ago. What's stayed the same or even improved in their relationship? Edit the speech examples above to suit your needs or use the writing prompts or advice for personalization to come up with your own. No matter what, finish the speech with your glass raised in celebration, and you'll have given an impressive toast worthy of the occasion.